T0 order Paperback or Kindle, click here. Did Joey Smallwood’s eagerness to throw in with Canada, combined with his autocratic rule and reckless spending on development projects of doubtful value, lead Newfoundland astray? This is one of the questions Ray Argyle deals with in his biography of the man who brought Newfoundland and Labrador into Confederation in 1949. 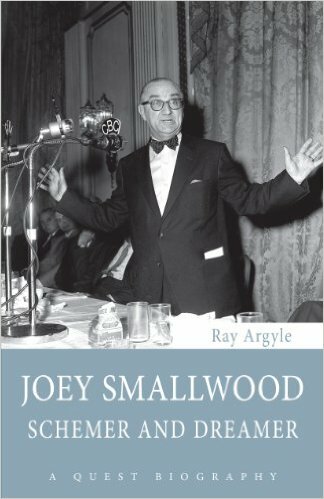 “Joey Smallwood: Schemer and Dreamer” brings to light many new facts about the life of the amazing figure – journalist, union organizer, farmer, politician – who almost single handed made his island the 10th province of Canada. Joey Smallwood was born in the Newfoundland outport of Gambo in 1900. After working on St. John’s newspapers, he headed for New York a committed Socialist, to write for the New York Call. But always his island home called to him. He carried a large map of Newfoundland and every week went to the Brooklyn docks to welcome the Bowring Steamship Co.’s “Red Cross” liner from St. John’s and meet new friends from home. In 1925, Smallwood returned to Newfoundland for good. He organized a fishermens’ union. He walked hundreds of miles of Newfoundland railways to sign up members for a railway workers’ union. He tried different types of farming, enjoying some success with a pig farm. Smallwood lamented that Newfoundland was one of the most poverty stricken corners of North America. It had gone bankrupt in the 1930s and had been ruled by a London-run Commission of Government through the Second World War. When Smallwood heard that the people of Newfoundland and Labrador were going to be given the chance to decide their future form of government in a referendum, he made up his mind to campaign for Confederation. In the second of two votes in 1948, Canada came out on top. Union of the two countries took place on March 31, 1949. Joey Smallwood became Premier, a position he held until 1972. He died in 1991. Decried as an autocrat, lambasted for endemic corruption and the “giveaway” of the Churchill Falls power development on terms favorable to Quebec, Smallwood always maintained he had but one goal: the betterment of Newfoundland. Was he its “savior” as some maintained, or the “treacherous devil” as his opponents saw him? After generations as a “have not” province, Newfoundland in recent years has boasted Canada’s fastest-growing economy, spurred by oil, mineral and power development. “Joey Smallwood: Schemer & Dreamer” reexamines the life of this incredible figure in light of Newfoundland’s progress, and measures his legacy against its newfound position as a province of prosperity rather than poverty. “Joey Smallwood: Schemer and Dreamer” is part of the Quest Biography series published by Dundurn Press. Very interesting, Ray, thanks for sharing your website. I do count it a privilege to have given him a handshake in ’77. As you shook the hand of Edward Mallandaine, born in 1867, I count it a miracle of sorts to have met Mr Smallwood, born 37 years later than Edward. Isn’t history fun! Manfred Range, Creston, B.C.